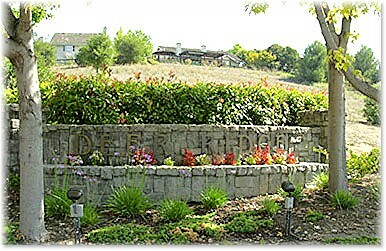 Deer Ridge homes are located in beautiful San Ramon, California. The homes are nestled on the hills off Alcosta and Montevideo Boulevard overlooking the scenic San Ramon Valley. What makes this a special place to live are first and foremost, the people. Our neighborhood is centrally located in our city with schools, shopping, and other city services close by. The school district is known for its excellent education and parent participation. We have 125 neighbors with front facing homes overlooking the valley and homes on the back tucked in along the gently sloping hills which opens up to a large, fifty acres, natural wildlife open space. Open space is owned by all 125 homeowners and is free to use for hiking and wildlife observing. It is truly amazing the animals that are present right in your own backyard. Deer come grazing down to your backyard, with a myriad of birds to gaze upon for the Backyard Bird Watchers. Deer Ridge is a neighborhood filled with friendly families with and without children. It is a place where your family can enjoy the surroundings while being able to play and relax at the same time. Our Homeowners Association is not one of strict CC&Rs as some communities have. This provides the freedom to truly enjoy the neighborhood. With large lot sizes and six different floor plans to choose from, makes Deer Ridge a place to really call Home. Be sure to check out the cool new Deer Ridge Homeowners Association 3d Map View. Check out the San Ramon homeowners resources: links and information for homeowners. Note: This website is provided as a courtesy for the Deer Ridge Homeowners Association. It is not the official HOA website. Please go to the contact page for contacting Common Interest Management Services, Inc. for all official communications items. If you would like to see some other items included in this website, feel free to provide your suggestion to the webmaster. Webmaster contact information is located at the bottom of the HOA contact page. Feel free to browse our website and are always welcome to ask a question or two. HOA contact information.